KPU School of Horticulture students took home Gold and Silver medals at the Provincial Skills Canada Landscape Gardening competition held in Abbotsford at TRADEX on April 18. Level 1 Apprentices (and brothers as well) Ridha Al-Rammahi and Hussein Al-Rammahi claimed the silver medal while Matthew Schmalz, Level 1 Youth Train in Trades Apprenticeship and teammate Stuart Albertson, Landscape Diploma, took home the gold. 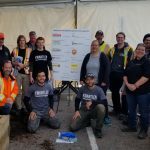 The two teams from Kwantlen worked extremely hard to complete the 6 hour competition of building a very complex garden design. Both teams were cool, collected and confident through the entire day, a testament to the preparation time both students have put in over the past five weeks to get ready for this tough and demanding competition. By lunch time both teams felt they were right on track for the finish with enough time to concentrate on the fine detail and workmanship needed for a winning garden. A constant stream of public and high school students who stopped at the event area were impressed by the teamwork exhibited by the competitors. When time was called to conclude the competition the gardens were exceptionally well done. No one was going to call the winner and it was all in the judges hands. After the judging was completed the judges took time to offer many wonderful compliments for the teams and were impressed by their skills and attention to safety and installation detail. The gold medal team of Matthew and Stuart by way of their win will be preparing to compete at the National Skills Canada Landscape Gardening competition in Edmonton, June 3 – 6, 2018.